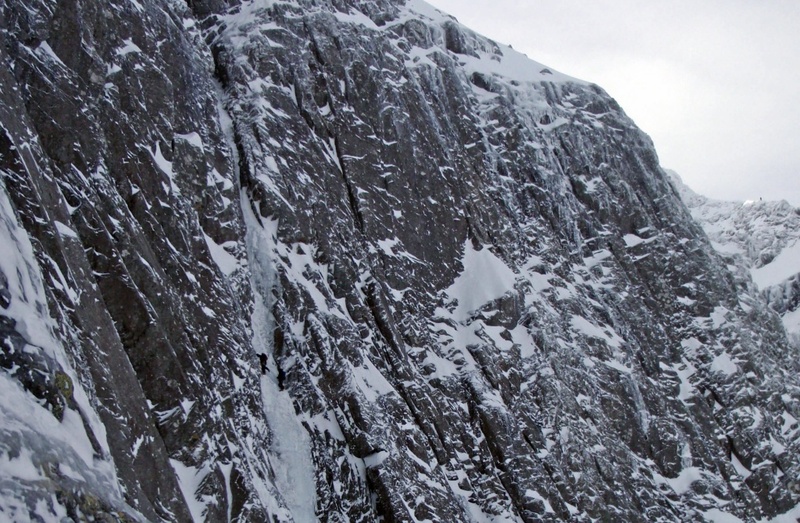 In the fourth of a series of articles about the finest Scottish winter routes, Jöttnar's Mike Pescod guides us through Point Five Gully, Ben Nevis. 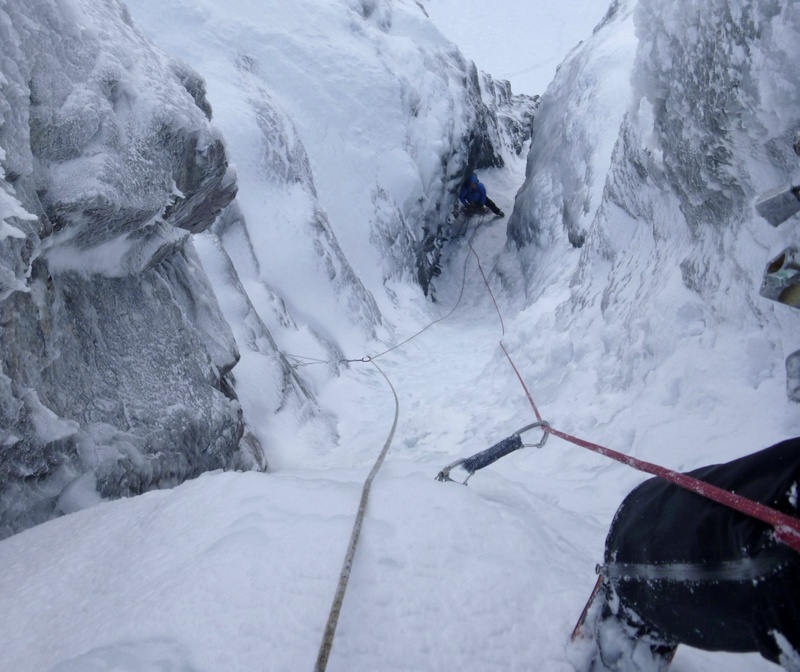 The most famous ice climb in Scotland (and possibly in the world) is reliable, popular and brilliant. 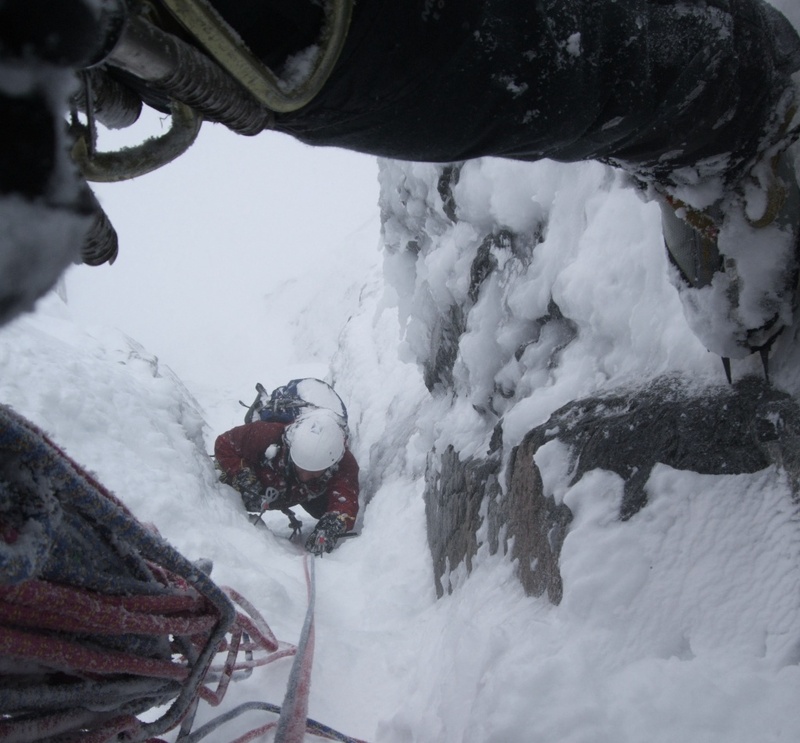 It is one of the most sought-after Scottish winter climbs and frequently attracts international climbers to Ben Nevis, with Point Five as their sole objective. It is a big funnel that catches a lot of snow and channels all the dribbles of water that run down it during thaw periods. This is a great combination to help build the ice quickly at the start of the winter, but it is also the perfect combination for pouring spindrift down onto you at the most awkward of moments. Interest in the route began in the 1930s but it wasn't ascended until 1959, eventually succumbing to a five-day siege comprising 29 hours of climbing time. Modern tools and techniques have hugely reduced this time although its reputation as a Grade V testpiece is undiminished. Any of the three hard pitches at the start can form the crux. Before it is fully banked out, the bulge at the top of the first pitch will have to be taken direct, giving you a good few moves of vertical ice. The Chimney Pitch is always more technical, requiring bridging, balancing and pulling over the steep bulges that form. The Rogue Pitch can then be a simple bridging exercise up a nice corner, or it can feel very steep, tenuous and bold. The only way to find out what it’s like is to give it a go! After these three pitches the angle relents to give three or four pitches of grade II or III climbing to the top. Leaving this climb until March can reduce the chance of poor ice and spindrift. 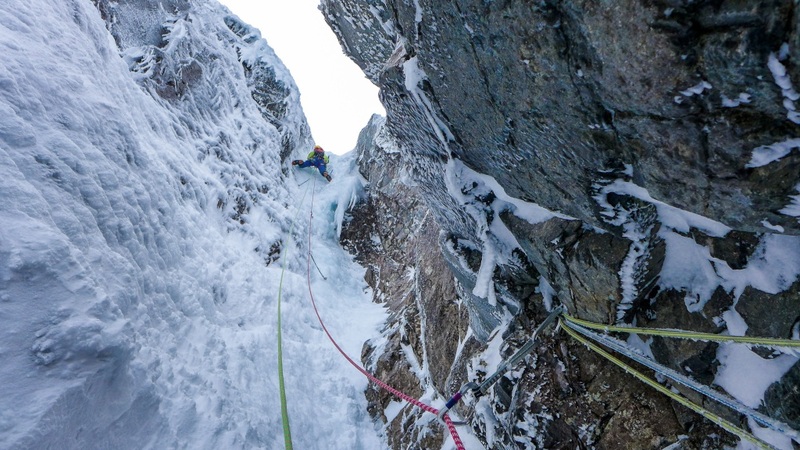 When it is well formed, banked out and when the weather is settled, Point Five Gully is the ultimate classic climb. Sometimes it is good to be patient. A justifiably popular route, often in condition and the benchmark grade V,5 from which all other steep snow-ice gully climbs are graded. Approach from high up Observatory Gully by a traverse under Observatory Buttress. The first three pitches give sustained steep climbing, either of which might present the crux. The first is to a belay on the left, the Chimney Pitch to a belay on the right in a deep recess followed by the Rogue Pitch to easier ground. Above, there is one steeper section (II/III) before trending right to pass the cornice. Beware of spindrift avalanches and falling debris from other parties. 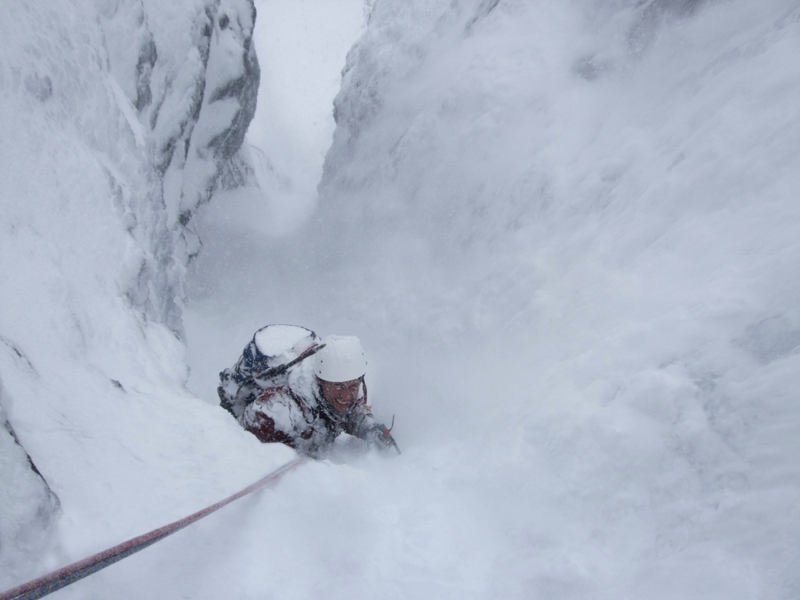 Note: For climbers on top form and requiring more excitement, it is recommended that they take to the left wall of the gully after the third hard pitch. Find your own way to the top at about grade IV,4 depending on the line chosen. An escape rightwards is possible (III) onto the Girdle Traverse ledge running towards Good Friday Climb. Move out right from beneath the last hard pitch (pitch 3). Mike Pescod is an IFMGA guide, and a member of the Jöttnar Pro Team. He is the founder of Abacus Mountain Guides, an outdoor guiding company based in Fort William, as well as being the author of the guidebook Winter Climbs Ben Nevis and Glen Coe.